Race into action with the galaxy’s greatest collection of mighty metal warriors! The most powerful heroes from the planet CYBERTRON are here to battle for the fate of the universe. With incredible ability to change into everyday objects and technology beyond your wildest dreams, these ROBOT HEROES are MORE THAN MEETS THE EYE! 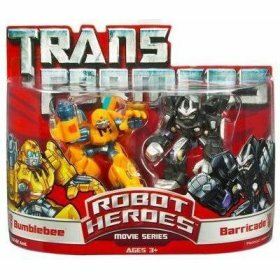 Two-pack of collectible figures includes BUMBLEBEE and BARRICADE figures. 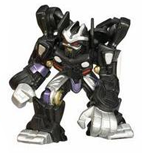 * Collectible two-pack of TRANSFORMERS characters includes BUMBLEBEE and BARRICADE figures – both in robot mode! * Product does not convert. Sold in a two pack with Bumblebee.